If you have spoken this phrase, you may well be awful. In addition to being a rude way to ask someone else to move, this cliché doesn’t hold up to careful consideration. It infers that a door always blocks one from viewing something in a way that a window does not. But doors don’t always impede vision. Aside from exceptions like glass doors, screen doors and doors that themselves have windows in them, even regular, opaque doors should be open at least sometimes. That’s their function: opening occasionally to allow passage through. So to accuse someone of being a door doesn’t really make sense, unless this person facilitates travel from one side of something to another, in which case being called “door” could actually be a compliment. But if you share literal qualities with doors — that is, the ability to let something pass easily from one side of you, through you, and over to the other side — you may want to see a doctor, for you’ve likely been shot with a high-powered rifle. And yes, you can blame Chuck Klosterman’s attack on “like comparing apples to oranges” for this little essay. I have thought about this one before too. My apartment is very small, and it often happens that after I use the kitchen sink I have to wait for my wife to finish getting something out of the fridge before I can get by her and back into the living room. On those times, I frequently think that it would be nice if she made a door at all, whether with or without windows. But then, you know, she stops using the fridge and I am reminded by-and-by of the utility of her non–door-like aspects. Gee, I always though the phrase meant you thought the person was more like Jim Morrison than James Iha. Carl: Glad to hear there's a real-life implication. I am curious about the images you use in this article .. What is the name of the picture? 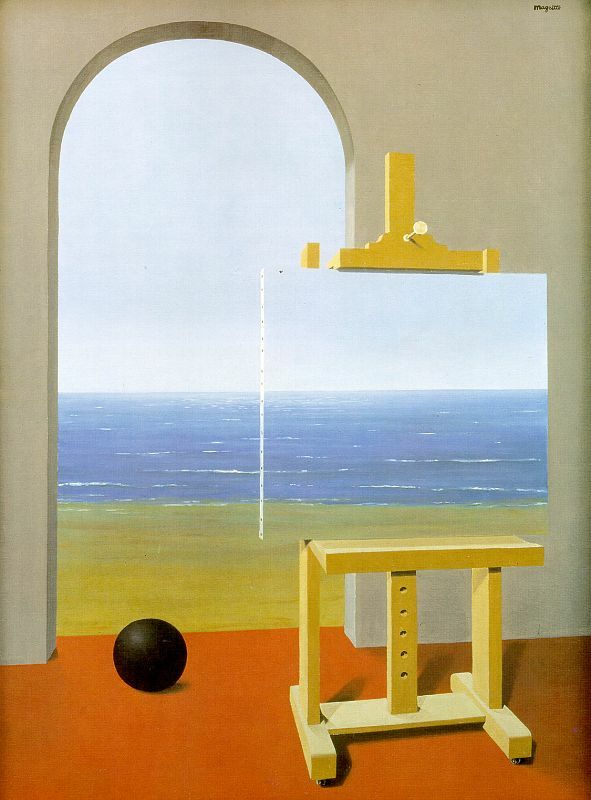 It's "The Human Condition" by Rene Magritte. Find the Hidden Galoshes on the U.S. Dollar Bill!